Lily made me these great purple socks for Christmas last year. The toes were a little tight and I promised her I would undo and redo them to my size. However, as I was unknitting, the idea of having my very own pair of pedi-socks was so much fun that I asked her permission to leave the toes out and add green trim. 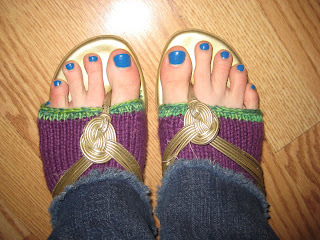 Voila; peek-a-toes AND warm feet! I LOVE THOSE! Really great idea! And the pedicure is perfect too!